La India achieved commercial production on February 1, 2014. Our Pinos Altos and Creston Mascota mine complex is approximately 70 km southeast of La India, providing operating synergy between the two properties. The La India mine is located approximately 200 km east of Hermosillo in Sonora, Mexico. The 639-square-km property includes the La India mine site, the Tarachi gold resource and several other prospective exploration targets, situated in the prolific Mulatos gold belt. The La India mine hosts proven and probable reserves of 0.6 million ounces of gold and 2.0 million ounces of silver (24 million tonnes of ore grading 0.74 g/t gold and 2.55 g/t silver) as of December 31, 2018. This includes an initial mineral reserve at the El Realito deposit of 84,000 ounces of gold and 418,000 ounces of silver (3.3 million tonnes grading 0.80 g/t gold and 3.96 g/t silver). The mine expects to achieve 90,000 ounces of gold production in 2019, and 95,000 ounces gold in 2020. Studies are ongoing to evaluate the potential to develop other satellite zones such as Chipriona. The La India mine lies within an extensive ancient volcanic field. It is in an area dominated by outcrops of andesitic, dacitic and felsic volcanic tuffs from different explosive volcanic events that were affected by large-scale north-northwest-striking faults and intruded by granodiorite and diorite stocks. Canyons cut through the uppermost layers to expose the Lower Series volcanic strata. La India lies in a large area of intrusion-related alteration dominated by volcanic-hosted high-sulphidation epithermal-hydrothermal gold, silver and porphyry-related gold deposits. Such deposits may be present as veins and/or disseminated deposits and/or breccias. The La India mine deposit area is one of several high sulphidation epithermal mineralization centres recognized in the region. Epithermal high sulphidation mineralization at the La India mine developed as a cluster of gold zones (Main, La India, El Cochi and North zones) aligned north-south, and El Realito aligned northeast, within a spatially related zone of hydrothermal alteration in excess of 20 square kilometres in area. Gold mineralization is confined within zones of argillitic alteration originally containing sulphides, and subsequently oxidized. The North and Main zones are within 2 km of each other. The Main Zone and El Realito are within 5 km of each other. The Main Zone mineralized system remains open along strike, and shows significant potential at depth; parallel mineralized structures have not yet been tested. The El Realito mineralization is found in northeast-striking subvertical parallel structural corridors of breccia that appear to have acted as conduits, bringing gold and silver mineralization into the favourable subhorizonal volcanic rock layers (the lower porphyritic dacite). El Realito remains open along strike (northeast and southwest) and shows significant potential at depth. Mineralization at Chipriona consists of what appears to be structurally controlled gold- and silver-rich veins, stringers and breccias with significant zinc, lead and copper content in sulphides. Surface mapping and sampling have traced stacked structures within the Chipriona mineralized corridor, which has a width ranging from tens of metres to a few hundred metres over a northwest strike length of at least 2,000 metres. Mineralization has been intersected from surface to a depth of more than 200 metres. Significant mineralization has been intersected near surface over substantial widths; this suggests the potential for bulk mining lower-grade mineralization in stockwork zones that surround high-grade feeder zones. Surface outcrop mapping and drill-hole data so far indicate that the gold system at the Tarachi deposit is likely best classified as a gold porphyry deposit. The La India mine is a collection of deposits grouped into three open pits – North, La India (Central) and Main – that are providing ore for a heap leach pad located just west of the North pit. Operations use traditional open pit mining techniques with bench heights of 6 m and utilize front-end loaders, trucks, track drills and various support equipment. Based upon geotechnical evaluations, the final pit slopes are 46 degrees. The mining rate is expected to be approximately 16,000 tonnes/day with a stripping ratio of approximately 1:1. In 2017, La India transitioned from mining the North Zone to the Main Zone. The development of satellite deposits provides an opportunity to extend mine life. La India’s processing flow includes a three-stage crushing process followed by a heap leach operation. Cyanide leach solution percolates through the heap to the lined solution-collection ditch that routes it to a double-lined pregnant collection pond. A zero discharge water balance is maintained at the heap leach facilities. Ore stacking and irrigation plans were optimized in early 2018, which is expected to provide more effective leaching dynamics. The gold adsorption, desorption and refining facility (ADR plant) consists of two parallel trains of six 3.5-tonne carbon adsorption columns and a Zadra strip with electrowinning. Gold-silver doré bars are produced in the refinery. The plant is designed to process leach flows from up to 6.0 million dry tonnes of ore per year (16,438 tonnes/day). Ultimate gold recovery is estimated at 69% when leaching is completed. The Company began construction of the expanded heap leach pad during 2018, which will provide capacity for an additional 6.2 million tonnes and is expected to be completed in early 2019. In addition, the Company expects to begin construction of the phase 3 heap leach expansion using the depleted North Zone pit in mid-2019, which is expected to be operational by mid-2020. In 2019, the Company expects to spend $2.4 million on 10,000 metres of exploration drilling on the satellite deposits and $0.7 million on 2,000 metres of conversion drilling at La India. Additional spending of $2.8 million on 10,000 m of drilling is planned in the Chipriona and Tarachi areas in 2019. Preliminary metallurgical testing is being conducted at Chipriona to determine the potential processing and cut-off grades for this type of mineralization; exploration drilling will test for extensions of the mineralized system. The Tarachi property is part of a large land package that surrounds Agnico’s La India mine in the Mulatos district of Sonora, Mexico. Tarachi is a large low-grade gold porphyry deposit with satellite epithermal mineral occurrences discovered in 2010. The gold system at Tarachi is best classified as a wallrock gold porphyry deposit, comprising sheeted veins that deposited gold within the wallrock outside the source dacite porphyry intrusions, suggesting that it has the potential to grow into a much larger deposit. Agnico Eagle acquired the La India property from Grayd Resource Corporation in November 2011, and within 22 months we had completed its design, permitting, construction and start-up. Mining began in September 2013, with initial leaching the following month. The first gold from La India was poured on November 20, 2013. 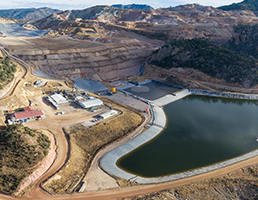 Commercial production was officially achieved in February 2014, and the mine reached its design capacity in 2017.